Crystal/Pearl Bouquet, any online sites? or have any other bouquet ideas in mind? I am looking for something different as my bouquet. My dress is a champayne colour and my bridesmaid or in cream and brown. Does anyone have any different ideas for a bouquet or know of any good online shops that sell crystal/pearl bouquets? Here are a few sites that sell the crystal bouquets, I think they are georgeous and completly different. The first link even has a matching boutineiere. I love the cascading one, I’m not sure what your budget it though because it’s $750. The other bouquets are in the hundred dollar range and less if you make your own, and the last link that i will post is for a company that does heirloom bouquets, they make porcelain bouquets, they look like flowers though so it might not be what you’re looking for! Good Luck! 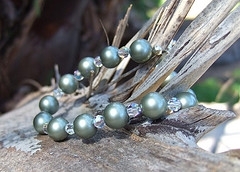 This entry was posted in Crystal Glitz and tagged bridal, bridesmaid, crystal, pearl, wedding on July 2, 2009 by admin.